The Best Got Even Better! Once again, AAS creates a new level of "realism" in the re-creation of the classic electric pianos. Not only does Lounge Lizard EP-4 deliver the authentic tone of the originals but it also preserves their action and feel. Once you get your hands on Lounge Lizard, that elusive electric piano sound becomes a reality you'll be propelled into inspirational space. The String Studio synthesizer swaps the traditional oscillator, filter, and envelope pattern for real-life string instrument components. 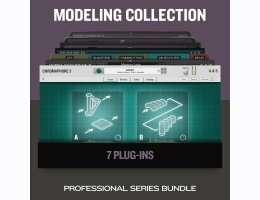 At the core of String Studio lies a new cutting edge string model interacting with picks, bows, hammers, fingers, frets, dampers, and soundboards. Through this direct approach, String Studio delivers stunning guitars, basses, harps, clavinets, bowed instruments, percussions as well as rich and animated tones that blend the warmth, naturalness, and density of real-life with unique and innovative timbres from yet unheard instruments. Strum GS-2 is a plug-in for the production of guitar tracks. With an impressive collection of acoustic and electric guitars, automatic chord recognition, sophisticated chord voicing, integrated strumming and picking action, MIDI riff library, amplifier, and effects, playing guitar on a keyboard has never been so easy. Objeq Delay is a creative effect plug-in combining acoustic filtering with a clever delay unit. The plate, beam, drumhead, and string objects impart evocative acoustic resonances to the input signal. Further shaping is also available via low- and high-cut filters. The in-series delay acts as a classic unit or can split the first and subsequent repeats to either remodel the attack or create complex rhythmic patterns. A LFO module completes the package with comprehensive modulation destinations to the filter, resonator, and delay parameters. Objeq Delay is a truly creative and fun effect with multifaceted applications. Objeq Delay is obviously a great delay unit, but the complete feature set takes it to another level. The acoustic resonator is a great percussion track enhancer—it’s fantastic on kicks and snares. The split between the first and subsequent echoes can mangle simple loops into new complex rhythms. The LFO allows various modulator-type effects such as flanger and chorus. And then when you bring it all together, a highly resonant object with the delay brings you into the drones territory. The Finest in Analog Sounds. In a world filled with reproductions and ever increasing complexity, Ultra Analog imposes itself as a unique and powerful synth that is fast, easy and remarkably versatile. At the heart of Ultra Analog are the best alias free oscillators of the industry, featuring standard wave shapes, hard sync, sub oscillators and integrated pitch envelopes for the most impressive evolving and dynamic analog tone you ever heard. Two audacious multi-mode filters with distortion are then applied to confer Ultra Analog its sonic character. Finally, carefully chosen modulation options are provided by two syncable comprehensive LFOs, four loopable velocity sensitive ADSR envelopes generators and vibrato. Chromaphone 2 is a synthesizer which uses acoustic resonators to create drums, percussion, mallet, string, and other unique instruments. Drumheads, bars, marimbas, plates, strings, and tubes are combined into pairs and played by a configurable mallet and a flexible noise source. Chromaphone 2 ships with a new streamlined interface, a new equalizer and compressor module, a new multi-effect processor, a new drumhead resonator, and more. The factory library has been completely redesigned and includes signature presets by artist and sound designer Sean Divine, Thiago Pinheiro, Daniel Stawczyk, and Christian Laffitte.